The book beckons with its seductive amber, gold and red cover, the shadowy portrait of a woman, its substance and weight, a hardback of course. And, in this case, the book lives up to and beyond the promise of the cover. 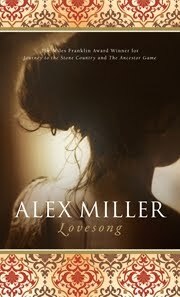 My No.1 Book Group read ‘Lovesong’ recently and I expected that we would all fall madly in love with the story, and the writer, Alex Miller. Not so. And this to me is the lure and joy of book groups. No two persons ever read the same book (a famous quote by Edmund Wilson and now perhaps a cliché) but entirely true. Shall I begin with my own reaction to this beautiful story? I loved it, for many reasons, but mostly because it is an enchanting old-fashioned kind of story-telling, the sort we don’t seem to get so much of. I dare even to suggest that there is something very male about this (read further on, before you judge me). The writer within the story befriends another man who tells him his story. So, we have the writer telling another man’s story, but... and here is the rub... it is not actually “his” story, so much as the story of his Tunisian born wife, Sabihba. And this is where my No.1 Book Group diverged in their opinions. Some took umbrage at these two men appropriating Sahiba’s story. They wanted to hear Sabiha’s version of the story. Now, how fascinating is that? And, of course, if you haven’t read the book, then you will be at sea, on this, and far be it for me to ruin things by revealing too much. We learn the story of Sabiha who has been sent from Tunisia to live with her Aunt Houria who is recently bereaved and runs a cafe in Paris but not in the tourist part of town. An Australian, doing his “OE”, stumbles into the cafe, falls in love with Sabiha, marries her and stays on to help her run the cafe when her Aunt Houria dies. Sabiha passionately desires a child. She believes this is her destiny. And it is this particular destiny that we follow in all its passionate intensity, as she fulfils her desire, bringing both joy and tragedy. There is romance too, and love, and the evocatively rendered Parisian (but essentially Tunisian) cafe where Sabiha sings to her customers. And then we return to Australia, where Sabiha and her Australian husband John are now living with their daughter. They own a pastry shop. Which is actually, where the story starts – we come full circle. Ken, an ageing writer, nearing the end of his career (or so we are led to believe) with a failed marriage and concern for his adult daughter who has come home to live with him, discovers the pastry shop on his return from a trip to Europe. Ken is befriended by Sabiha’s Australian husband John (or does Ken befriend John?) whom he meets at the local swimming pool... the story unfolds. 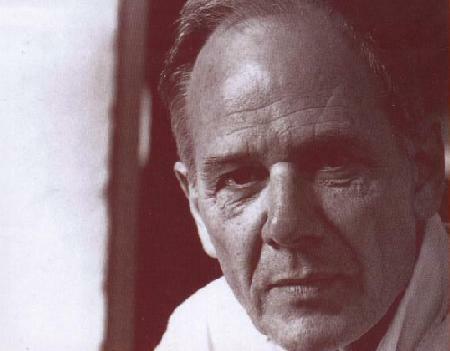 One man, tells another man (who just happens to be a writer) a story. Some in my book group were more interested in the untold story of Ken, his failed marriage and his relationship with his daughter. It is this reaction that most fascinates me... the idea that the reader begins to have an opinion about a fictitious writer’s fictitious and as yet, untold life. How wondrous is that? But, perhaps it also testimony to the real writer, Alex Miller, that he has engaged us in this passionate discussion of his intensely passionate story to the extent that some of his readers want to know more about the fictional story-teller than the story he is telling. Just let me warn you of Bruno (I could tell you more, but I won’t). He is a central to the heart of the story and such a powerfully evoked character, that I venture to say he is unforgettable. But then too, he is an entirely male construct in many ways and so perhaps this is where the divergence of opinion begins. I say, go along for the ride, enjoy, and love this extraordinary tale which is also utterly a women’s story. It is the sort of book that leaves a taste, a literary lingering, and the characters will not fade, they stay with you. Isn’t that what makes a great book? Plus, the ending has a very satisfying twist. The idea of who owns a story is raised – and this fits very nicely in with the objections by some of my book group who felt resentful about the appropriation, of Sabiha’s story. Oh, but, it is truly a great ending if you are a writer. What I would like to know is how I’ve never heard of Alex Miller (pic left) until now. After Maggie's review I am obviously going to have to read the book for myself. It is an the Miles Franklin longlist of course. The full long-list is: Figurehead, Patrick Allington; Parrot and Olivier in America, Peter Carey; The Bath Fugues, Brian Castro; Boy on a Wire, Jon Doust; The Book of Emmett, Deborah Forster; Sons of the Rumour, David Foster; Siddon Rock, Glenda Guest; Butterfly, Sonya Hartnett; The People's Train, Thomas Keneally; Lovesong, Alex Miller; Jasper Jones, Craig Silvey; and Truth, Peter Temple.